The Glyptodon is a genus of large prehistoric mammals that lived in the late Pleistocene era, i.e., between 3 million and 11,000 years ago. There were at least seven species that fell under this genus, viz. G. clavipes, G. elongatus Burmeister, G. euphractus, G. munizi Ameghino, G. petaliferus Cope, G. reticulatus, and G. rivapacis. These creatures belong to the placental group of mammals Xenarthra which also includes anteaters, tree sloths, extinct ground sloths, extinct pampatheres, and armadillos. The glyptodon was first discovered in the first half of the 19th century and was later named by Sir Richard Owen, an English biologist, comparative anatomist, and paleontologist, in 1839. 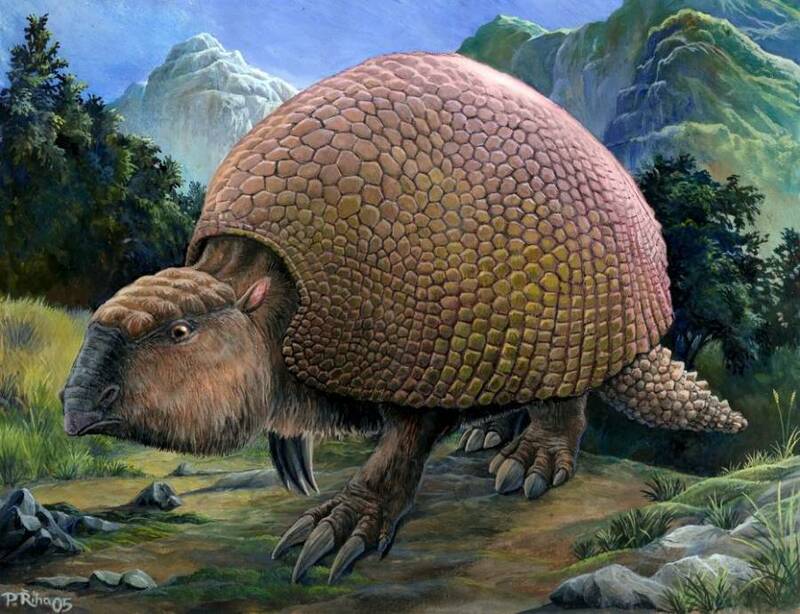 When fossils and fragments of a new prehistoric creature were unearthed, the contemporary scholars initially acknowledged a common genus naming it as ‘Glyptodon’; however, there was no unanimity regarding its name. In 1837, Dr. Lund, a biologist, professor, and author, who published a memoir on Brazil’s ancient animal life, suggested of recognizing this creature as a new genus Hoplophorus, while in the following year, yet another scientist, Prof. Bronn proposed to name the new genus Chlamydotherium. In 1839, Prof. D’Alton’s called it Pachypus in one of his publications, while scientist M.L. Nodot named it Schistopleuron. Finally, it was Sir Richard Owen who could point out the common similarities of the genus which his fellow scientists described in their works, and Owen realized that they all are hinting at the same genus. Eventually, Owen classified the creature as “Glyptodon”, confirming that it is one and the same creature. These creatures were protected by a hard shell like the armadillo or tortoise, comprising of more than a thousand bony plates, each 2.5 cm in width known as the scrutes or osteoderms. All the species included in this group had their unique patterns of scrutes and the type of shell. However, like the tortoises or turtles, these animals were unable to withdraw their heads inside the shell. To make up this discrepancy, they had a different kind of adaptation. Glyptodons had a hard bony cap on the top of their head (skull). The tail, which was also excluded from the protection of the shell, was made up of a ring of bones. The passage of the nose was reduced with heavy muscle attachments that are thought to be for a proboscis, or trunk, similar to the modern-day tapirs and elephants. The lower jaws were very deep in order to support the big muscles inside the mouth to help them chew fibrous or coarse plant matters found along the banks of lakes and rivers. 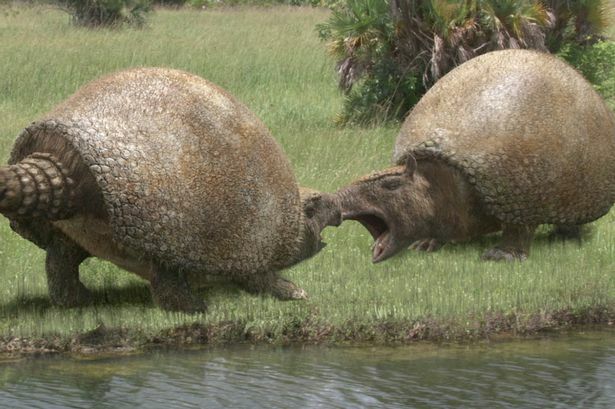 Scientists believe that the glyptodonts would engage in inter-species fights, especially male to male. 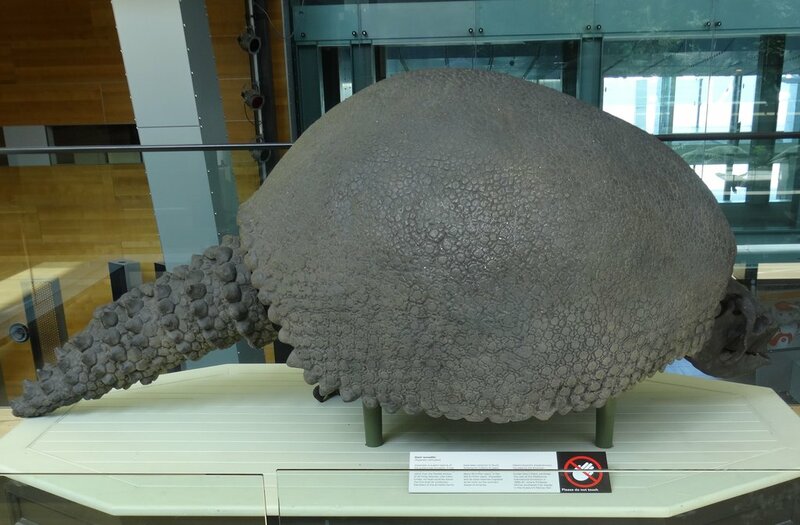 The tail of Glyptodon, made of bony plates, was flexible enough as a weapon during such fightings. Paleontologists, using mathematical calculations, have concluded that their tails were able to generate enough force to break the hard carapace. However, the tail could also be of use as a strong defense against other predators. Fossils of these creatures have been found showing signs of carapace damage. The glyptodons followed a strictly herbivorous diet, and live on plant matters growing by the side of the water bodies they would dwell around. The spices under the genus Glyptodons are considered as the biggest ancient armadillos. Their primary reason to go extinct was due to hunting by the humans that would usually kill them for food and collect their carapace to use as shelters. The carapace of the creature was so hard that it was almost impossible for the carnivores to kill or eat them unless they would turn them over. The creature weighed as much as a small size car and was as long as a Volkswagon Beetle. 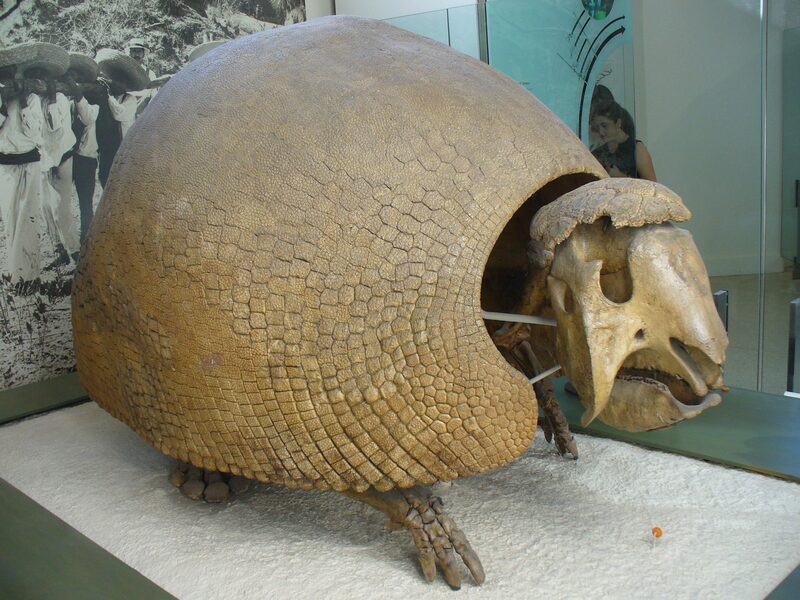 The term ‘glyptodon’, in Greek, means a creature with ‘grooved or carved tooth’. Published on September 25th 2018 by admin under Mammals.